Hello friends, it’s been a while! Blogs tend to come and go, you’re familiar enough with the reasons for that, so I’ll instead give a little update on what I’ve been doing in the last two and a half years! I had a kid! Yeah, I buried the lede, this is really the big one. His name’s Rowan, and he’s great. Generally figuring out what life looks like in this new phase. Turns out having a kid will kind of redefine everything. Started working on a novel! Since Rowan came along, finding time to be creative has been hard, but in the last year I missed it dearly and made a point of finding time for it. I’m happy to say it’s been going well and I’ve been putting a lot of work into not just writing but into outlining, plotting, and asking a lot of questions about my writing to help me improve it. I’ve also been working (admittedly more slowly) on a new game design. Since this has gone relatively well and I’m dedicated to pushing forward, one of my resolutions for 2018 is to resurrect this blog by posting once a week. That’s the goal, we’ll see how I do with it! Once a week seems doable, though. I’m not locking myself in on any specific topics or days for these posts. And hey, if there are special requests, please let me know in the comments. I’m looking forward to getting back to blogging. Happy new year! Pretty Little Liars and ALL the Secrets! And damn do they have good clothes, too. …usually. I’m looking at you, Aria. Over the last few months, I’ve been playing catch up on Pretty Little Liars, got through Season 5 just in time for the start of Season 6, and was able to watch live as we all found out the true identity of the Liar’s long-game tormentor, A. I actually watched this show live when it first started six years ago, but stopped before the first season ended. Why did I stop? Why did I start up again? What do I think about the latest but oddly not quite final plot twist? Let’s dive in. Expect spoilers. Reader mail: Where can I read [your book] online for free? Don’t pirate books. Don’t pirate games. In general, really, don’t pirate stuff you can buy or rent or get on loan that someone worked really hard to create. Oh, ew. Ew. I feel icky. I hate answering this question. But answer it I must. First of all, thank you for wanting to read my books. Really. I realize that on this planet there are trampoline gyms and elephant rides and a whole host of other fun things you could be doing with your time, so I appreciate the fact that you wish to devote it to eyeballing my words. I am touched and humbled. Plot and story derive from conflict – anybody who’s tried writing anything has figured this out at some point. In order for something to happen, you need the character(s) to do something. In order to make that something they do interesting, there needs to be something at stake. Things are only at stake if there is some situation in which Option A is preferred over Option B and yet, with inaction or failure surpass some obstacle, Option B will come to pass or remain. That state of affairs is called “conflict” – I want A, but I have to overcome (whatever) to achieve it, otherwise B. So concludes your really, really basic lesson in plotting stories. Win a Signed Copy of THE OLDEST TRICK! Today only! You could win this, and with my name scribbled in it! Surely, your descendants will sing of this immortal day! Today is a very special day. My friend, A.F.E. Smith, has a book out today. It’s called DARKHAVEN, and it sounds really cool, and you should all buy it. To celebrate, AFE is throwing a release party, at which you can win many prizes and much wealth. Well, prizes. Mostly in the form of books or artwork from your favorite authors. Which, now that I think of it, is very much the same thing as wealth. I, the intrepid author of this, your fourth or fifth favorite blog, am participating in this party in two very important ways. Announcing: THE OLDEST TRICK, releasing on July 14th! So, by now you’ve heard me jawing about my two novels (The Iron Ring and Iron and Blood) which, together, really comprise a single novel. That single novel was the one I originally submitted to Harper Voyager and now, after being apart for so very long, they are together again at last! This is my vision as I originally intended it – the director’s cut, if you will (though, really, it isn’t any different than the other two books, just presented back-to-back in one volume). To avoid any potential confusion, you will note that the cover artists have combined both covers into one bold, yellow vision. 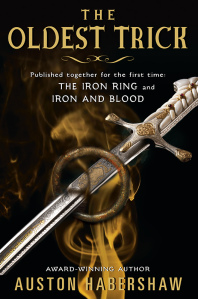 Yes, ladies and gentlemen, my book has been reunited with itself and now you can read the entirety of The Iron Ring and Iron and Blood in one volume under its original title, THE OLDEST TRICK! Yes! 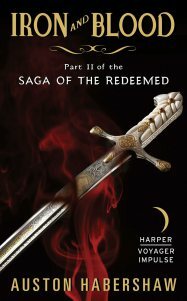 Finally, Blood and Iron, Part 2 of the Saga of the Redeemed, is released today! Now you can all buy it and see for yourself. Please do! Found wherever fine e-books are sold!